I wasn't planning on re-reading this book as well. I just finished re-reading Cinder, Scarlet and Cress. But it had been over two years since I read those books. And I read Fairest this February. But I couldn't resist reading it again. And I'm so glad I did. I feel like I had forgotten some things. And oh, how much I love this book. I probably shouldn't love it as much as I do, but I can't help it. I just felt so badly for Levana. Reading about her life. Sure, she's evil, but I still kind of love her. I really loved reading about her life. I know that Levana is a horrible person. She manipulates a lot of people, including her poor husband. She has people murdered. But even so, I couldn't help but love her a bit. She was so broken. Because of her older sister. Because of her sister burning her when they were young. And I just. I cannot. My heart is breaking for Levana. She's alone and unloved. She just wants to be loved. I don't agree with things that she did, not at all, but I cannot truly hate her for it either. I know that others do that. But I cannot. no Selene. That Channary had died, alone and childless. That Levana was already the true queen. There is so much I love about this book. Even though it is very short, I felt like I got to know so much. And I loved it. I just wish it had been even longer. Fairest is a sad story. The life of Levana is a very sad story. And I loved reading about it all. I know people think Levana is bad. But I figure that her sister was even worse. What she did to Levana as a child. What she did to her seamstress. It was so evil. She was awful to everyone. Except for her new baby. I think that she loved Selene. She seemed to love her child. The story in this book is so exciting. 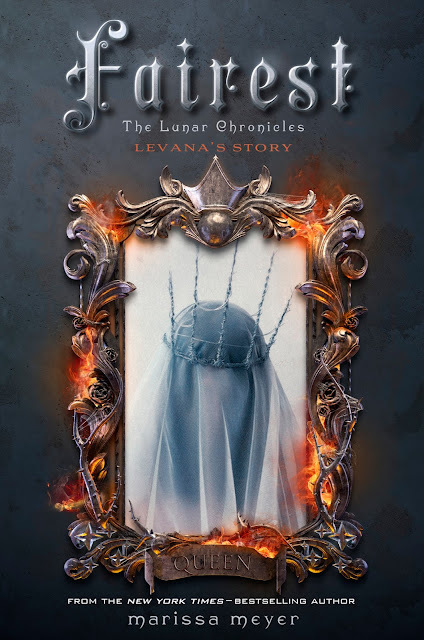 We get to read about Levana as a teenager, first at age fifteen. When her parents died. I'm not sure I liked the little we got to know about them at all. They seemed cruel. And then we learn about Levana's crush. A guard whom is more than ten years older than her. He is married. With a child about to be born. But Levana wants him. And she convinces herself that he wants her too. Especially when his wife dies in childbirth. Oh. It was pretty heartbreaking to read about. I'm not going to say much about it all. But she gets the man to be with her. To marry her. But he does not love her. And she makes him pretend to love her. It was so heartbreaking. Not only that she ruined his life. But also because she just wanted to be loved, to not be alone. And I understood her about that. But yeah. What she did was not right. Not at all. I liked reading about Evret. And his child, precious Winter. Oh, reading about her as little was so adorable. I cannot wait to know her more in Winter. So excited. might stay with her forever, but she was the queen. I'm not saying much more about this book, as I have already done so once before this year. I just. I cannot deal with how much I love Fairest. It is an amazing book. Levana is a villain, sure. But she is a villain that I love. I can't help it. I liked her a lot in this book, despite all the horrible things that she did. I'm so glad I decided to re-read this book right now too. It is just so awesome. If any of you haven't read Fairest yet, then you really need to do so before Winter comes out. It is a must read book. I promise. New review of Cinder. New review of Scarlet. New review of Cress. I liked Cinder but stopped at that one! I think, at the time, seeing that the series was four books long really threw me. Perhaps now that Winter is (almost) here, I will consider binge-reading the series. SO glad you loved this one so much, Carina! After reading this book I hate Levana ever more! Ugh. She is so despicable. I hope she gets what's coming to her in Winter. LOL. Thank you for sharing your thoughts, hon! I hope you love Winter soooo much.